They all have to study English, but students have a hard time linking what they learn in school with what society expects from them. The Ministry of Education, Science and Technology, seeking to recognize the efforts of teachers, has comprised a list of the top schools across the country with creative English programs to address this problem. At Haeseong International Convention High School in Seoul, they seek to go beyond the standard education goal ― studying to receive high marks on the standardized College Scholastic Ability Test ― and teach practical English that the students can use long after an exam. “Our school is a convention school and the students have a lot of interest in conversational English so we support all those essential skills,” said Choi So-yeon, an English teacher at the school recognized by the Education Ministry. “We make idioms and expressions, 10 a week, and they’re submitted to every single class and the classrooms talk about them,” said Haeseong’s native English teacher Jennifer Graham-Magill. But it is not just the students that are learning English. The entire faculty is given phrases beforehand that they can use in their classes, which helps to create a more immersive English environment. Choi said almost all the students at the school memorize the phrases, and even apply them. Choi said that they believe the scholastic ability test is important, but their students, recognizing the importance, constantly seek other English skills. Creating an English-only environment is what the teachers at Gocheok Middle School, another recognized school in Seoul, decided to do. According to Oh Ae-ran, an English teacher at the school, their “English Only” office helped to facilitate communication among everyone inside, including students. “Outside of class, students are constantly walking in and out of the office to speak with the native English teachers, so it really benefits the students who are truly interested in English,” she said. “I think that students are learning more from coming to us in the office and chatting on what they learn in class,” said another English teacher. But creating an English-only environment outside of class is not the only thing the teachers are proud of. “We will reward students for more creative longer sentences, just related to their own interests,” she said. This approach encouraged the students at the middle school to not only participate in the exercises but help develop confidence. “Students like to talk about what they know and themselves, if they’re comfortable with that they can branch out into more,” she said. Another strategy that Gocheok Middle School has implemented is dividing classes based on the skill level of the students, which helped to create a competitive environment. An issue that both Haeseong and Gocheok wished to tackle is the cemented importance of private after-school academies, or “hagwon.” Most students are sent to hagwon, which are increasingly seen as an educational necessity ― one which middle-income families struggle to provide. So in order to give all students equal opportunities, the teachers at both schools developed their English programs. Another school in Seoul has also been recognized for dividing their students based on their skill levels. Seoul Eunjung Elementary School split their third grade class as a trial run for last academic year. 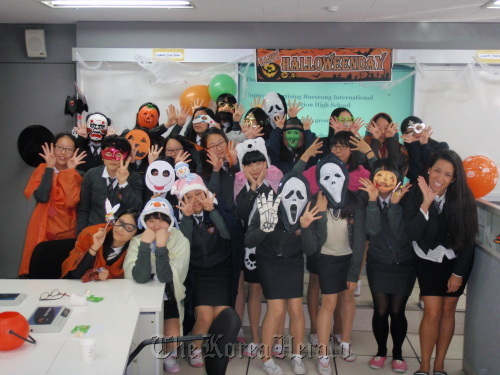 According to Kim Kyoung-ae, an English teacher at the school, the “overall performance” of the students has been excellent. These attempts by teachers to take English education into their own hands, has been applauded by experts. According to Kim He-young, professor of English education at Chungang University, any attempt to bring about change is good, and schools need to emphasize more than just prepping for university admissions. “I think that the ministry’s list is one of those things that attempt to solve the problem,“ she said, referring to the gap between English education and society’s expectations. Kim In-ok, professor of English education at the Chuncheon National University of Education, also agreed that bridging the gap between the scholastic ability test and the actual goal of communication is necessary. Despite the shortcomings of the English education system in Korea, there are teachers with the vision and initiative to lead students into their future.